Three attacks on police and troops in Russia's South on Wednesday have left two men dead and seven wounded. ­Police in the republic of Dagestan were searching cars on one of the region's highways when gunmen opened fire, killing one officer and injuring five. In another attack in the same region, one officer was wounded when an improvised bomb went off as a police convoy was passing by. And in the neighboring Chechen republic, a soldier on a search mission was killed by an as yet unknown explosive device. Russia's North Caucasus has recently seen a rise in the number of militant attacks, despite efforts by the authorities to crack down on terrorist groups. “We are witnessing very serious and very dangerous tendencies which take place in the North Caucasus,” - said Russian Interior Minister Rashid Nurgaliev, as quoted by the news agency. A bomb plot was foiled in Dagestan on Tuesday. The information was released by Russia’s National anti-terrorism Committee, reports Interfax. A make-shift bomb was found at 7 am in Khasavyurt by police. A suspicious vehicle attracted their attention and sniffer-dogs confirmed that explosives were present. Police cordoned off the site and evacuated residents from nearby houses. 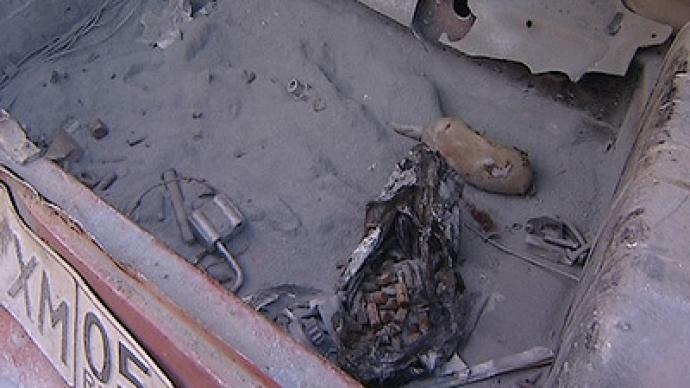 By 3:30 pm the bomb was made safe by the Federal Security Service Directorate specialists. The radio remote-controlled device was stowed in the trunk of the vehicle. It consisted of a 65 liter container with a time-fuse filled with explosives and strike elements such as stones and screws, to cause victims greater harm. According to the information provided by the official site of the National anti-terrorism Committee, similar plots were foiled in Makhachkala on October 27 and 29. In both cases, the improvised bombs with a time-fuse were detonated under the control of bomb technicians. On November 7, RIA Novosti news agency reported that a total of 454 terrorism-related and 510 extremism-related crimes were registered in Russia over the past nine months.